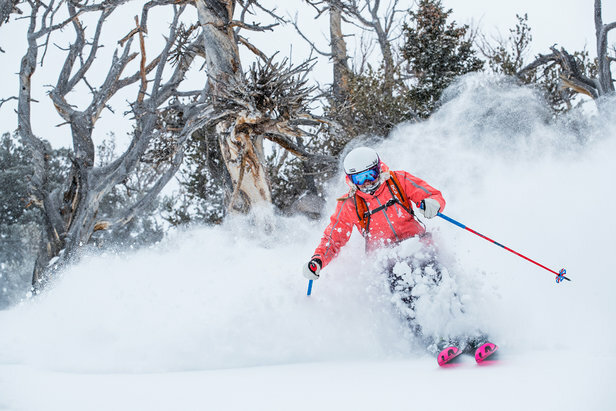 What will the snow be like this ski season? 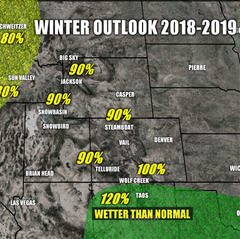 When it comes to the long-range weather forecast for winter 2018/2019, we are currently on "El Niño Watch." 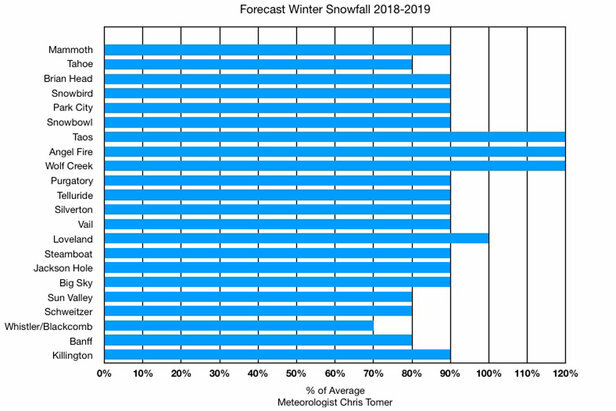 The consensus of model data predicts a 70 percent chance of an El Niño developing for the 18/19 ski season. That means warmer than normal water in the south Pacific will drive the overall weather patterns across the United States. 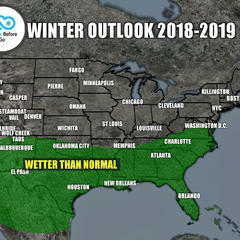 Here's where my winter outlook differs from the consensus. I believe we're looking at a variation of the traditional El Niño and have adjusted my weather forecast accordingly. I see cooler than normal air temperatures in South America, cooler than normal water temperatures in the southeast Pacific off the coast of South America, cooler than normal water temperatures in the eastern Atlantic and cooler than normal air and water temperatures in India and Indian Ocean. These differences are inconsistent with traditional El Niño patterns. Related Read: What is El Niño? The dominant jet stream pattern favors a warmer than normal west and colder than normal east. Warmer than normal temperatures in the west could force snow levels to run higher than normal at the beginning and end of the ski season. The result is rain or rain/snow mix at some lower elevation ski areas. 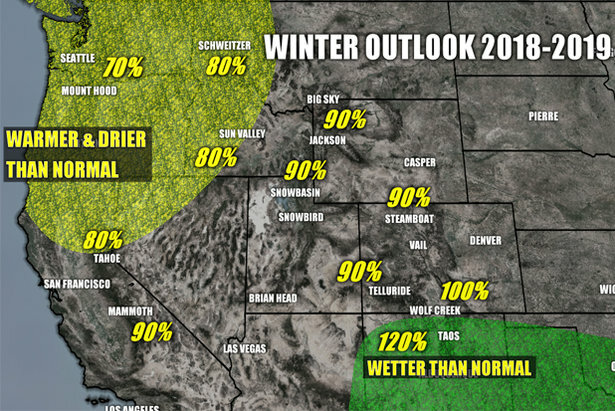 A mid-winter rain is also possible. 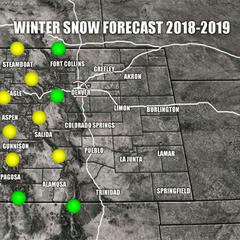 Considering all these variables, the ski areas in best position for cooler temps and consistent snowfall include certain parts of Montana, Wyoming, Colorado and New Mexico (more details below). In the Northeast, we could see a few colder than normal stretches with Nor'easters being more likely than normal. 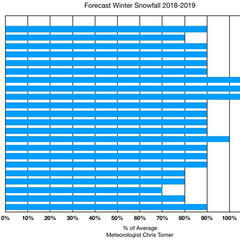 Percentage of Average Snowfall Ski Resorts Will Get This Winter? 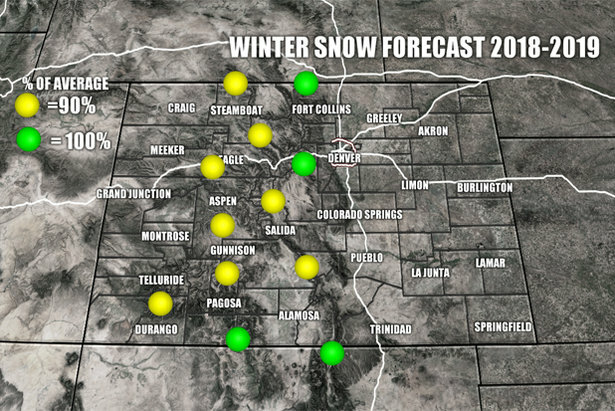 Get Weekly Ski Forecasts All Season! For the best early season skiing, look to Banff, Big Sky, Jackson Hole, Loveland and Arapahoe Basin. By mid winter, I like Snowbird, Jackson Hole, Big Sky, Bridger Bowl, Steamboat, Winter Park, Loveland, Wolf Creek, Taos, Angel Fire, Jay Peak, Sugarloaf and Wildcat. The wildcard is California. 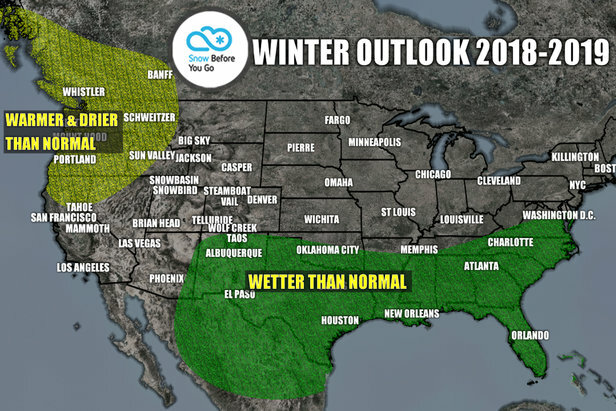 If this forecast plays out, then it could be an abnormally warm winter. However, if a traditional El Niño develops, then California could be back in the game.